The Tiger Woods golf games of the past were focused on advancing a single player career or getting some games in with your friends. They were good, fun games that were built around mechanics reliant on precision and a variety of meters and gauges. The Golf Club is still a good round of golf at its heart, but it is built on several different principles. One is a lack of gadgets - your swing mechanic is tied to the animation on screen, relying more on feel than what a meter reads. The competitive, asynchronous online mode provides some 'competition' no matter a person's availability and cuts out wait times. Lastly the course creator attempts to give you powerful editing tools so that a variety of golf courses can be built, customized and shared out for the rest of the world to play. Most of what The Golf Club tries to do works quite well, but not quite everything. The swing mechanic was the first, most glaring thing after I installed The Golf Club and fired it up. Swinging for the fences at 100% power was easy enough. You are reliant on the character's animation to determine roughly how hard you are hitting it. You can see distance to the cup and have an idea of how far your club will carry with a perfect strike on a windless day. The thing is, you almost never get a perfect hit without any wiggle and there is almost always some breeze, so club choice is incredibly important. There were times I found myself running through holes very effectively, but then I would hit that one hole with a water hazard, mess up my shot and man - that round was effectively ruined by the time I pulled myself together. The part of me that loves micro-managing strategy game armies really misses the gauges that tell me at what power and accuracy I am swinging, but there is something to be said for observing the subtleties of the animation and just getting a proper feel for the game. It is a far cry from what I was used to from other games of golf, but I do like it because it feels quick and accessible and certainly more natural. The visuals are stunning. 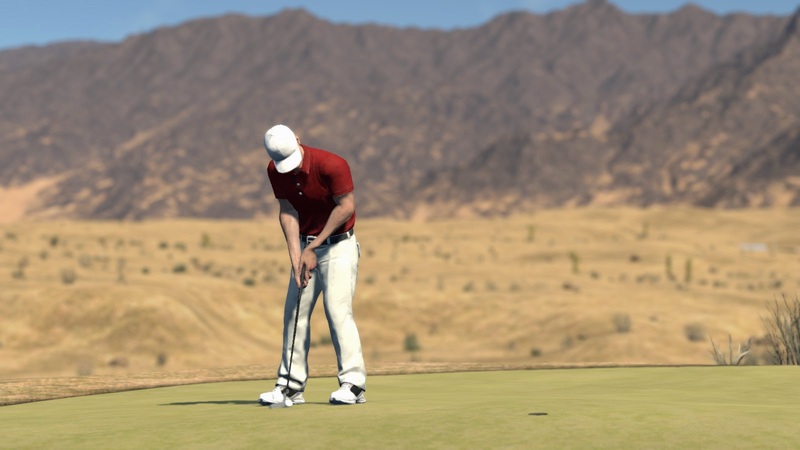 As Robert noted in his preview for the PC version of the game, the courses are absolutely gorgeous, though the golfer models themselves do not hold up quite as well, standing out a bit from the photo-realistic backdrops. That being said, the golfers themselves certainly do not look bad, as their animations are smooth and key to proper success when striking the ball. The audio does not fare quite as well. The voice announcing along with the game is pretty amusing in and of himself. He has a hint of sarcasm in his voice that had my oldest daughter grinning on more than one occasion as he remarked on a particularly bad shot of mine. More egregious is the lack of variety in his canned sayings. Forget hearing the same thing multiple times in a round, you can hear the same thing multiple times in a single hole. The most glaring example was when I was putting, and the commentator said something, and then I missed. He then repeated the exact same phrase immediately afterwards. The asynchronous online play is one of those features I never knew I wanted in a golfing game, but loved it when I saw it. It reminds me of Forza 5 for the Xbox One and the way that it simulates your friends' racing when you are on the track. 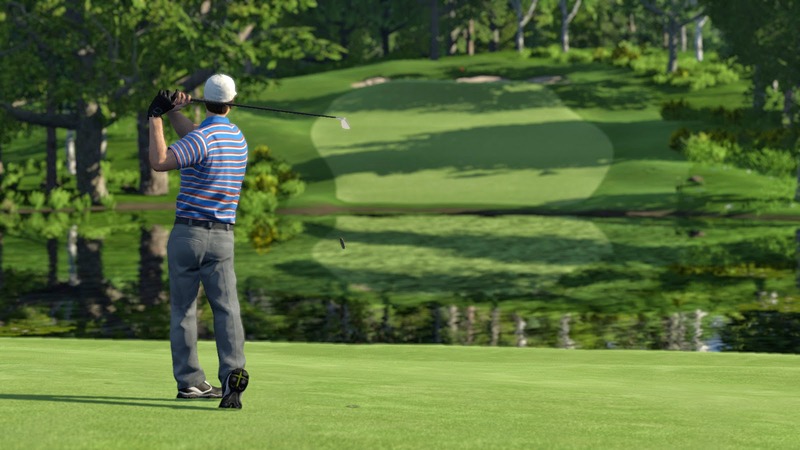 As you play through a course in The Golf Club, you can see a ghosted image of how someone else played it. It is interesting to see how someone else approached the hole, and also lends itself a bit of simulated competitiveness. Certainly I was unable to trash talk a random user I had never met before, but it is a unique way of populating tournaments and Tours. One of the most exciting aspects of The Golf Club was the course designing feature. This feature was touted as a team-up with Greg Norman, and received a lot of early attention. There is no doubt that the ability to create your own courses and edit them with a bevy of options is exciting. I am someone who can spend dozens of hours on a feature like this and the tool is indeed powerful. Flattening, dipping or raising the land, dropping in a variety of bunkers or water hazards and so much more occupy your tool box here. However, now we come to the most glaring example of problems with this title and the Xbox One platform. Robert had a chance to preview and play this title on a powerful PC, and the performance was excellent. 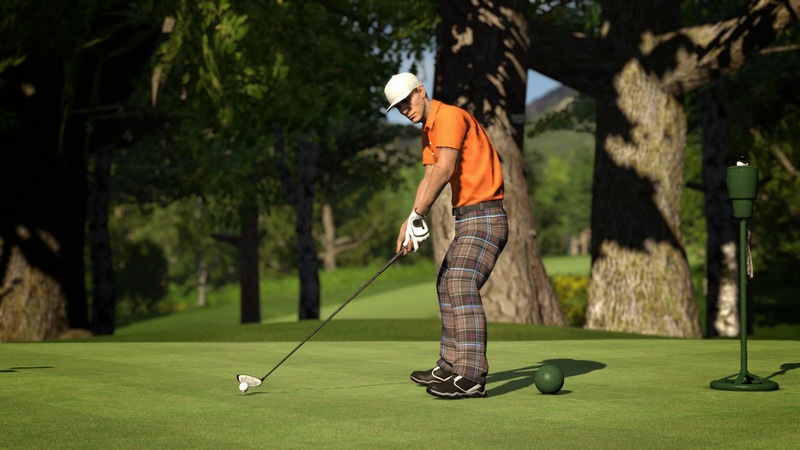 The Xbox One version of The Golf Club appears to be less than optimal, however. In their Dev Diary, it was noted by the team that the transition from PC to console was going to prove to be a challenge, and there have been several right out of the gates. Sometimes the audio gets choppy and stutters between holes, and the initial loading of the course seems to take forever. The menu screen often feels like it is chugging. Sometimes the selection cursor flies around the screen no problem, sometimes I need to press to the right four or five times before my selection box moves to the next option. Twice when loading up matches, the game crashed. This sent me back to the title screen both times after things 'froze' for about three minutes, followed by a loud burst of distorted sound. Most frustrating however, was the performance of the editing tools. The course itself generated quickly enough and moving around the course from one hole to another was easy enough, but the actual editing process was unbelievably laggy. Cycling through tools or stamps has a hiccup here and there, but actually applying a change to the landscape can take upwards of two minutes - for each and every addition or change. Editing three holes took me nearly forty minutes before I just saved and gave up. I went back into the game, kicked out a few more rounds and that seemed to go alright, but the editor was hugely frustrating. However, I was pointed towards one tip that really helped with the sluggish performance. Doing a hard restart on the console cleared the cache and the editor and loading screens both saw marked improvements. The editing tools only took a second or two to apply after doing this, as opposed to the minutes required before. There have been some disconnect issues since the game released yesterday, but having had a chance to play the game prior to its release, I can attest that this was not normal behavior. If I were to make a guess, the servers are just getting hammered with the new release right now. Another fun feature was the live play. The asynchronous options are nice, but I was able to play the same course at the same time as a friend last night, and it moved along quite nicely. I sometimes fell a bit behind him, but we were able to see each others' shots and the commentator would make a remark about my friend getting an eagle or 'good news for you' - when he got a bogey. At the end of the day, The Golf Club is an excellent game of golf, with solid and approachable mechanics and beautiful scenery. There is an absolute ton of replay value to be had given the community support options and the urge to best your friends who play the same courses. Unfortunately a lack of varied audio and some performance concerns on the Xbox One console do mar the experience at this point.